Primero, Prime, Primus, Primiera, Primavista, often referred to as “Poker’s mother”, as it is the first confirmed version of a game directly related to modern day poker, is a 16th-century gambling card game of which the earliest reference dates back to 1526. The game of Primero is closely related to the game of Primo visto, if not the same. It still seems uncertain whether the game of Primero is of Spanish or Italian origin. Although Daines Barrington is of opinion that it is of Spanish origin, the poem of Francesco Berni, the earliest writer to mention the game, affords proof that it was at least commonly played in Italy at the beginning of the 16th century. His work entitled Capitolo del Gioco della Primiera, published in Rome in 1526, and believed to be the earliest work extant describing a card game, contains some particulars on the game of Primero. According to David Parlett, the game is still very much played in central Europe and Spain with Italian-suited cards under the name of Goffo or Bambara, remaining the major native vying game of Italy. This old game of cards was called Prime in France, Primera in Spain, and Primiera in Italy. All names derived from the Latin primarius (first). In English literature, besides the occasional use of the foreign names, the game is designated Primero (and also Prima-Vista, a probable variant), with the usual corruptions in spelling of the early days. Primero is actually a Spanish word, meaning "first" or "chief." According to Stephen Skinner, Primero and Prima-vista (ab Ital. Primiera, Luxus qu dam chartarum, ab Ital. Primiero, Primus, & Prima-vista. Primus aspectus), are one and the same game. As for John Minshew, Primero and Prima-vista (Primum et primum visum, that is, first and first seen, because he that can show such an order of cards, wins the game), are two different games of cards. Whichever opinion these two lexicographers might have had on the origin of Primero, it seems fairly plausible that the game being played in different parts of Europe had to acquire similar names as it migrated from one country to another, or from one region to the other, notably in Italy and Spain. And with the addition of new rules to the original set of rules, or even variations on the rules that the game devised, it finally reached a level of development that made them become separate games, despite their common origin. So, as the Italian writer Berni said: "The game is played differently in different places." Four Gentlemen of High Rank Playing Primero, now attributed to the Master of the Countess of Warwick or his circle. Daines Barrington, described an Elizabethan card party painted by Federico Zuccari, and that originally belonged to Lord Falkland, in which Lord Burleigh is represented playing at cards with three other persons, apparently of distinction, each having two rings on the same fingers of both their hands. The cards used are marked as at present, although they differ from those of modern times for being narrower and longer. Eight of the cards lie on the table with the blank side uppermost, for the cards at that time had blank backs, while four remain in each of the other players hands. 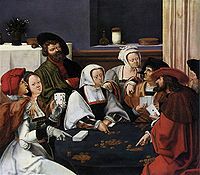 A particular in this painting is that one of the players is seen showing his cards, which are: the Knave of Hearts, the Ace, Seven and Six of clubs. The cover of the pack lying on the table displays two lions supporting a shield, upon which is what appears to be a Rose (the crest of the Tudor House), and underneath, though indistinctly, the name of a French card-maker Jehan Licl**rer. This particular, most certainly, gives proof that the cards then used were obtained from France. The money on the table, together with considerable heaps of gold and silver, appears to be coins of Edward VI and Queen Elizabeth I. As the first Marquess of Exeter, Lord Burleigh, is said to have entirely devoted his time to business and study, taking no diversion but that afforded by his gardens, of which he was both fond and proud, it is to be supposed that this painting was not "his" portrait, though mistaken for his, as was the ownership of the old manor-house of Wimbledon. So, there seems to be little doubt here as for which game the artist meant to describe, and that the person exhibiting his cards to the spectators had won a Flush, for his three clubs are the best cards for counting. A passage in an old play by Robert Greene has been quoted by several writers as evidence that Primero was a gambling game. But a person who objects to cards, might make such a remark with respect to any card game, whether a gambling game or not. Judging from the partial descriptions of the game which remain to us, it might seem that Primero was played for either large or small stakes, as agreed upon. John Florio describes Primero played by two persons for "one shilling stake and three rest (pool)." In Minsheu’s "Spanish Dialogues," four play; the stake is two shillings and the rest, eight. The text is self-explanatory, explaining also the meaning of the name Primero. 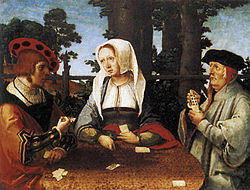 The game of Primero appears to have been one of the earliest card games played in England during the Renaissance and the Tudor dynasty, and certainly it continued to be one of the most fashionable games throughout the reigns of Henry VIII, Edward VI, Mary I of England, Elizabeth I and James I, due to the frequent mention of it by many writers of that time. Already during the reign of Henry VII, notices of money issued several times for the King’s losses at cards appear in the Remembrance’s Office, dated December the 26th, in the ninth year of his reign. There, an entry is made of one hundred shillings paid at one time to him for the purpose of playing at cards. The private expenses of Princess Mary, Henry VIII’s daughter and later Queen, also contain numerous items of money "for the playe at cardes." But despite the records, it is not certain that Primero found its way to England previously to the marriage of Queen Mary I with Philip II of Spain, although there is no doubt that his coming to England from the court of Charles V would have cause it to be more generally known and played. William Shakespeare also speaks of Henry VIII playing at Primero with his brother-in-law Charles Brandon, 1st Duke of Suffolk, and makes Falstaff say: "I never prospered since I forswore myself at Primero.” Additionally, the clown Lancelot in Shakespeare's The Merchant of Venice confides in this father that "for mine own part, as I have set up my rest to run away, so I will not rest till I have sun some ground" (2.2.91-92). To "set up [one's] rest" alludes to a type of gamble in the Italian version of Primero (see below).' Among the epigrams of Sir John Harington we have one which describes The Story of Marcus' Life at Primero in which many of the terms of the game are majestically developed in detail. Judging by the pattern of succession of games during the Renaissance, it is to be noted that many of the card games played throughout Europe, ascended in popularity to be later replaced by another type of game, again brought into England by the court gamester of that time. So that, by the last quarter of the 16th century, the game of Primero had already decreased in popularity, and was gradually replaced by the Trump family game known as Maw, the favorite card game of James I, and alluded by Sir John Harington to succeeding the game of Primero. According to Cotton, the game of Primero, which by the time of the Restoration in 1660 had already evolved into many other variations, some of six cards, rapidly went out of fashion with the introduction of the Spanish game of Ombre. The object of the game, as in Poker, is to attain the highest possible hand, or at least bluff your competitors out of betting against you. There are no existing written rules for the 16th century Primero, only descriptions. However a number of reconstructions of the game have been made, primarily on the basis of books describing playing strategy and references in period literature. Primero is played with a 40-card deck, though there are special decks just made for this game. It works best with 4 to six players. He who holds the 'Prime', a sequence of the best cards and a good trump, is sure to be successful over his adversary - hence the game's denomination. Numerus (Point) Two or three cards of the same suit. A point of higher card-value beats one of lower value for which purpose Courts count 10 each of the hand is the sum of the cards. Ace, 6, 7 and Jack cards in any suit. Supremus (Fifty-five) The highest possible three-flush, the Ace, 6, 7 (plus an unrelated fourth card) and Ace card from any other suit. Primero (Prime) One card from each suit. It’s a four-card hand containing one card of each suit, hence the exact opposite of a “Flush” in Poker. The major gambling game based on this combination goes back to the 16th century, being known to Gerolamo Cardano as Primiera, the noblest of all card games, to François Rabelais as Prime, and to Shakespeare as Primero. It is assumed that the subject of this painting may not be the obvious three card players, but in fact it may refer to a secret political alliance between Spain and England against Francis I of France. The figure on the left would be Charles V and on the right Cardinal Wolsey, both entering into a secret agreement. The woman in the centre would be Margaret of Austria, sister of Charles V and regent of the Netherlands. Because this is a gambling game, the first step is for all players to ante into the pot. The deal is counter-clockwise, starting with the dealer. Each player receives 4 cards dealt in 2’s from a 40-card deck ranking K Q J 7 6 5 4 3 2 A. Anyone dealt a winning combination calls for an immediate showdown, and the player with the best hand wins the pot. Two cards go to each player, which is followed by the next phase of betting. Two more cards are dealt to each player, then eight cards are dealt face down on the table, or the remaining cards are left out as a draw or stock pile. The other way is to lay out eight cards and draw and discard from only those cards. Each player then may draw and discard from the eight cards on the table. When a player is satisfied with his cards, he may knock on the table, calling out: Vada (go! ), which brings an immediate showdown won by the best hand. If no one bets, the stakes are carried forward to the next deal; but if one stays in, at least one other must contest the pot, this obligation ultimately falling upon the player immediately ahead of the last bettor if everyone else has folded. In a showdown, the better equal combinations are those with the highest point. Thus, a quartet of Aces (4x16=64) beats a quartet of Fives (60), but it’s beaten by four Sixes (72). Four Kings will not beat four Queens or Jacks, as these hands all count 40. Such ties are broken in favor of the eldest hand competing. Players “vie” by stating how high a hand they are claiming to have, and may “bluff” by overstating it. What they apparently must not do is to underbid their hands; for as Cardano puts it: "If anyone wins with the greatest point, he is obliged to show another card; otherwise he loses his deposit because he could have a “Flush”… Similarly, if he “vies” on the basis of point, he is obliged to show two different cards and one of a matching suit, so that no one may suspect him of having a “Flush” or “Prime”. A player may either knock or draw in a turn, but not both. Once a player knocks, he may no longer draw. When two players have knocked, the play stops, and cards are shown. Betting starts after the two cards are dealt, and may continue after these two cards have been dealt, and then at every round, just before the dealer’s turn. The dealer always bets first. Players may match, raise, or fold any time during wagering. If all players refuse a bet, it must be withdrawn. In Florence, it is custom to leave out the sevens, eights and nines, keeping and vying only with the smaller cards; the "rest" (To set up a rest = to win it, is a phrase which occurs in almost every poem in the times of James and Charles. It is taken from terms used at the game of Primero, and perhaps other games then played) is made at the second card, and when the first player say “pass”, every one is obliged to discard, notwithstanding any one may have an Ace or a Six in hand. In Venice, for instance, the mode of playing may be different; in Lombardy, Naples, France and Spain, so many countries, so many customs. But of all the modes, none can be superior to that of the court of Rome. There, the sevens, eights and nines are not withdrawn; there it is allowed to discard, but not both cards after “pass” is once said; nor can this be done with the two cards of the “rest”, as it is usual in other places. The most essential operation of this game may be its two principal heads, the “Flush” and the “Primera”, and a third, derived from the first, which is called “Punto”; from these three are deducted all the varieties which daily occur at Primero, as the greater and less “Flush”, the great and little “Prime”, and more or less points, which diversity gives rise to numerous controversies, and a thousand disputable points. Another not less excellent operation in this game is: four cards of one sort, four court cards, four aces, etc., conquer both the “Flush” and “Primera”. Jacob Le Duchat, in a note on that chapter of Rabelais, in which the games Gargantua played at are enumerated, has described the mode of playing Primero, and a similar account may be gathered from the Dictionary of the Spanish Academy. According to Duchat, there are two kinds of Primero, the greater and the lesser; the difference between them is that the former is played with the figured cards, while at the latter the highest card is the seven, which counts for 21. Each player has four cards, which are dealt one by one; the next card in value to the Seven is the Six, which counts for 18; then the Five, which counts for 15. The Ace is equivalent to 6 points, but the Deuce, the Trey and the Four count only for their respective numbers. To these cards may be added, if the players choose, the Quinola, for which the Knave of Hearts is most commonly chosen, and of which he may make what card and what colour he likes. After which each of the players show their four cards, and he whose cards are all of different sorts wins the prime, if they are all of one colour he wins the Flush. This game, according to the Great Spanish Dictionary, is played by dealing four cards to each player; the value of the Seven, Six and Ace, are the same; but the Deuce is said to count for 12, the Trey for 13, the Four for 14, and the Five for 15, the figured cards are each equivalent to 10. The best hand is the great Flush, that is, four cards of high numbers and one of one colour; the next is the Punto, consisting of the Quinola, Seven, Six, and Ace, which count for 55; then the Primera, or Prime, which is four cards of different suits. Should two persons had Flushes, he who counts the highest number, or the greatest Flush wins, and the same regulation holds good in regard to the Prime. But should there be neither Flush nor Prime, that who can count most points in one suit, wins.